What most people don’t realize, though, is that the gut isn’t just the stomach and intestines but the mouth, too. When we consider the many potential triggers of autoimmune thyroid disease, we have to think about our mouths—especially the teeth and gums. An abscess, infection, root canal, dental surgery, dental X-ray, fluoridation procedure, amalgam fillings…all are possible igniters of autoimmune disease. Could an unknown or unaddressed dental issue have triggered your thyroid condition? I recommend beginning to think about your dental timeline to see if you can trace any decline in your health to a dental procedure. 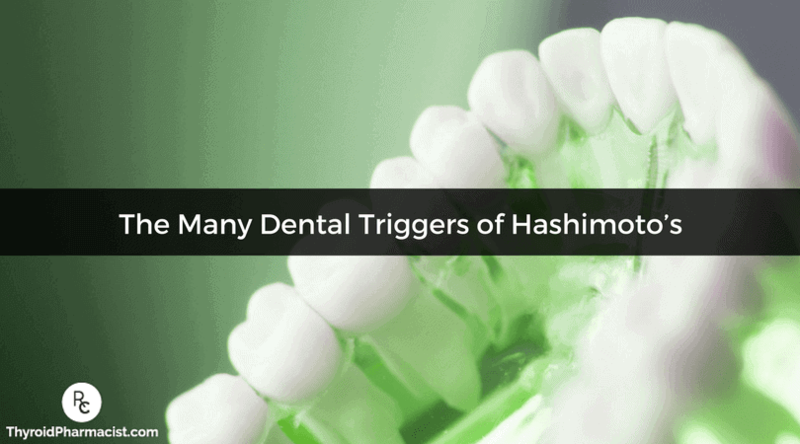 In the meantime, let’s look at some of the potential dental triggers of Hashimoto’s and how you might address them so that complete healing can happen. There are several potential causes of inflammation in the mouth—all of which will need to be resolved before you can recover fully from Hashimoto’s. Impacted teeth. Impacted teeth can create inflammation around the root of the other teeth and can lead to gingival inflammation, periodontitis, and tooth decay. If you’ve been eating a “modern” diet containing flour, sugar, and processed vegetable fats, developing tooth decay is more likely, and adopting a more ancestral diet may help with preventing new onset tooth decay. Mouth bacteria and dental infections. Mouth bacteria, abscesses in the mouth, and even hidden infections can lead to gut dysfunction and trigger autoimmune disease. A dental abscess is a collection of bacteria usually present in the gums surrounding the teeth. An abscess usually looks like a boil on the surface of the gums and is very painful. The bacteria from the abscess can stimulate our immune systems and drain into the gut creating digestive symptoms. You can often prevent dental infections through the use of oral self-care, but in many cases, the infections will need additional interventions from the dentist, such as antibiotics, draining, or even surgical intervention. Symptoms may include dental abscess, jaw pain, and/or headaches. If you have not had a dental X-ray or dental exam in over a year, or currently have a dental issue, be sure to make an appointment with your dentist ASAP. Some dental infections may be “silent” and only a dental exam will reveal their presence—this means even if you don’t have obvious signs or symptoms of a dental infection, it’s a good idea to get an exam if it’s been over a year. Periodontitis can lead to receding of the gums, loose teeth, and eventually tooth loss, and can be worsened by fluoride—the very substance added to our water and toothpaste to prevent tooth decay! Symptoms may include bleeding gums (especially with brushing or flossing), puffy gums, receding gums, plaque buildup on teeth, loose teeth, bone loss in the jaw, and bad breath. Periodontitis has been connected to dental dysbiosis or an imbalance of bacteria in the mouth. The conventional dental approach to periodontitis may involve scaling and root planing, where the roots of the teeth are scraped and cleared out to allow for better gum reattachment, surgery and gum grafts, as well as utilizing the antibiotic doxycycline to restore a better bacterial balance. Doxycycline penetrates the gums 7-20 times more effectively than other drugs, which means it can get to those deeper gingival crevices where pathogens can hide. While previous research implicated oral bacteria in triggering periodontitis, I was excited to learn that French-Canadian dentist Dr. Mark Bonner has found that most cases of periodontitis are caused by two parasitic infections of the gums: Entamoeba gingivalis and Trichomonas tenax. Entamoeba gingivalis was found in 69 percent of diseased gingival pockets but was absent in healthy gum tissue. This bug is transferred from person to person through kissing and may also be present in dogs, cats, and horses. The parasite Trichomonas tenax may be found in another 5 to 20 percent of periodontitis cases and is also found in people, cats, and dogs. While Dr. Bonner has trained over 600 dentists worldwide on his protocol, the majority of trained dentists are in French-speaking countries. He has started to host seminars in English, and dentists in the US are beginning to take notice as well. Overall, I’ve noticed reduced gum inflammation in Hashimoto’s patients after using gut balancing herbal protocols such as the ones in the Rootcology Gut Reset and prescription antiprotozoal agents, such as metronidazole (Flagyl) and Nitazoxanide (Alinia), which have activity against amoeba. However, herbs and prescription medications without the dental cleaning methods may not be able to penetrate the gingival pockets deeply enough to get to all the organisms. Another consideration is that this amoeba is passed through person-to-person kissing, so you may also want to make sure your kissing partners are treated accordingly. Dental procedures, such as a tooth extraction or root canal, can lead to less-than-obvious infections which must be resolved if you want to feel completely better. Tooth extraction (that leads to cavitation). When you have a tooth or teeth extracted, there is a risk for a cavitation to occur. A cavitation is a hole in the jaw that can collect bacteria while open, and then as the jaw heals over it, bacteria is trapped inside and ultimately leads to infection. Root canals. Root canals are dental procedures that are done when the root, or inside of the tooth, becomes infected. During this procedure, the tooth is cleaned out and the nerves and insides of the tooth are removed, but the root and tooth are left in the mouth—essentially leaving a “dead tooth.” Many of these teeth can harbor infections and when the nerve of the tooth is removed, we are less likely to sense them. Symptoms may include deep jaw pain, sensitivity to hot and cold, headaches and/or migraines. For cavitation as caused by tooth extraction: If your symptoms started post wisdom tooth removal, you may want to work with a biological dentist to rule out this type of infection. The cavitation can be drained and cleaned out by this type of dental professional. For root canals: If your symptoms began after a root canal procedure, it may need to be cleaned out surgically by a dental specialist or have the tooth removed. Unfortunately, these infections are more likely to be inaccessible to antibiotics. Amalgam fillings, called “silver” fillings, contain 50% of mercury by weight. They also contain small amounts of silver, tin, copper, and zinc. Amalgams are a major source of mercury exposure in the general population, accounting for two-thirds of human mercury exposure. Mercury is continuously released from the fillings—every time a person chews—as mercury vapor is not a chemically stable compound. Rates of absorbed mercury from amalgam fillings range from 9 to 17 mcg/d, with an uptake estimate of 12 mcg/d. Research has shown that mercury from amalgams does accumulate in thyroid tissue. The more mercury fillings a person had, the higher amount of mercury was deposited in their thyroid gland. If you do need to have your amalgam filling removed, it’s critical that you have them removed safely. When done improperly, the process can cause you to breathe in additional, possibly large doses of mercury vapor—a big problem if you have the MTHFR gene mutation and intestinal permeability (an excess of mercury exposure all at once can overburden your detox pathways). Liposomal Glutathione – At my recent book signing in Chicago, one of my readers, a biological dentist, mentioned remarkable improvements in people with mercury toxicity through the use of Liposomal Glutathione. I’ve also had clients and readers report huge benefits with this product, however, I have one hesitation in recommending it—it does have soy, so it’s not appropriate for people who are soy sensitive (60-70% of people with Hashimoto’s). For best results, before undertaking the removal of dental fillings, I recommend building up your resilience by completing my Fundamental Protocols, the Liver Support Protocol, Adrenal Balancing Protocol, and the Gut Balancing Protocol, before getting amalgam fillings replaced. The success of removing amalgam fillings is highly dependent on your body’s ability to clear toxins. 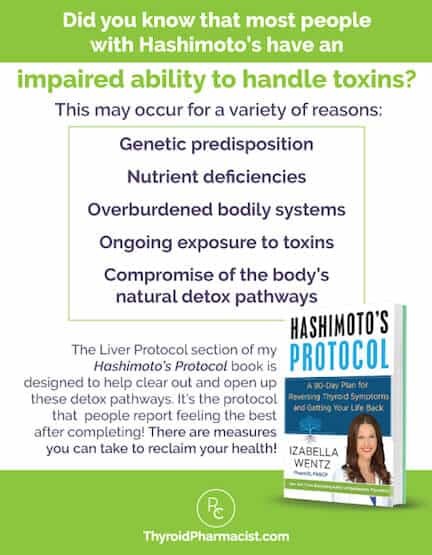 Most people with Hashimoto’s already have a toxic backlog, and as the body’s primary detox organs are the liver, skin, and gut, the Fundamental Protocols will give your detox capabilities extra support. The protocols can also be done afterwards. Fillings, onlays, bridges, braces, plastic aligners (like Invisalign), and other types of materials used for dental work may trigger an immune response in some individuals. This is a sign that the materials used may be incompatible with your own unique biochemical makeup. Again, what’s important here is that you become familiar with your dental timeline—can you trace your symptoms back to the introduction of any of the materials or dental alignment tools mentioned above? Even “tooth-colored fillings,” referred to as dental composites, can be an issue for some people who may be sensitive. Some composites contain BPA, a known thyroid toxin, which can be released from dental materials and potentially cause symptoms to develop. With the exception of Invisalign, it may not be feasible to remove materials used in dental work. It may also not be entirely necessary. Before going to extreme measures, I recommend that you introduce protocols into your life that can boost your detox abilities and substance tolerance. It’s also important that you—and anyone else with an autoimmune condition—start working with a biologic dentist to get tested for biocompatibility. Going to a biological dentist will help ensure that any future dental work will be done using only the safest materials for your distinct biochemistry. Even small amounts of radiation have been found to be of detriment to the thyroid gland, so it’s wise to limit your exposure to radiation. Get digital X-rays rather than film x-rays because they are safer overall and provide less radiation. Use a thyroid shield/guard. A lot of dental assistants may only give you a chest guard, but don’t let them pressure you into doing the X-rays without properly protecting your thyroid gland. You can also purchase your own thyroid guard to bring to appointments with you. To remove fluoride, you have to know where to find it, and you’ll probably be surprised by some of the sources: dental treatments, certain medications, supplements, bottled beverages, teas (especially the red and black varieties), canned food items, chewing tobacco, toothpaste, and water (in fluoridated communities) can all contain fluoride. Some people have reported improvement in thyroid symptoms and thyroid function tests following removing fluoride from their lifestyle. You can only remove fluoride from water by distilling it, using reverse osmosis filtration systems, or activated alumina defluoridation filters. Most other filters do not remove fluoride. One of the most convenient and cost-effective reverse osmosis water filters out there is AquaTru’s countertop filter. I have one in my bathroom that I use on a daily basis! It’s super easy to setup (no plumber required! ), and I feel better knowing that I’m brushing my teeth and washing my hands with purified water. This is also a great option for apartments or other places where you can’t adjust the plumbing. Plus, the wonderful people at AquaTru have been so generous to offer my readers a discount! Another option is having a plumber or handyman install an under the sink reverse osmosis unit. These typically cost around $200 and provide a consistent, daily source of water without fluoride. I recommend that you use the fluoride-free water for cooking and drinking, for your pets, and family. Water delivery services will deliver fluoride-free water to your home or office, if installing your own filter isn’t an option. I’ve mentioned the term “biological dentistry” here a few times, and I want to give you a better understanding of what this is exactly because I truly believe it to be a safer way to maintain a healthy mouth—something we’ve established is important to your overall health—especially if you have Hashimoto’s or other autoimmune disease. Of course, one of the most vital factors in maintaining healthy gums, teeth, and mouth is our own self-care practices. Some consistent, focused effort here can minimize the need for invasive dental work (anything beyond a cleaning) and reduce inflammation. Let’s look at a few strategies you can implement on an ongoing basis that will help improve and maintain oral health. Dental cavities are related to the pH of our mouth, which allows for specific bacterial species to proliferate, as well as the nutrition we take in. Cutting back on sweets, soda, tea, and coffee, and following any of my Root Cause-approved diets, can help reduce the acidity in the mouth. You can also try brushing your teeth with baking soda for one week to help create an alkaline environment in the mouth, making it more difficult for the pathogenic bacteria to survive. Many of us are not familiar with proper brushing techniques. While brushing your teeth, aim at the gum line, as that’s where most of the pathogenic bacteria live. You can do this by angling your toothbrush up to reach upper teeth and angling it down to reach lower teeth. The most helpful way to brush is through applying gentle pressure and a jiggling motion; Sonic toothbrushes can do the work for you. Flossing is also an important daily habit to start as this will help to dislodge food particles (aka, food for the pathogenic bacteria). Water picking: Using a waterpik may be helpful in displacing pathogenic bacteria, allowing for their removal. Oil pulling: Oil pulling is an old Ayurvedic remedy of swishing around sesame oil or coconut oil in the mouth and between the teeth. To try: First thing in the morning, put one tablespoon of either sesame or coconut oil in the mouth and swish around for 5-20 minutes until the oil turns white. Then, the oil is spat out along with the toxins in it. In theory, this method helps to break down the “homes” of bacteria, which are usually made of microcapsules of oil. While water won’t penetrate those microcapsules, sesame oil can, and mixes readily with the bacteria and becomes white in color. Cranberry juice: Cranberry juice has been found to have anti-adhesion properties which prevent the attachment of the bacteria to our body’s surfaces and may also help to dissolve the protective coats that store the bacteria. Oral probiotics: Oral probiotics are an accelerated way of getting beneficial bacteria into our mouths so that they can displace pathogenic bacteria and reduce inflammation in the mouth. Dr. Jeffrey D. Hillman was able to identify strains of probiotic bacteria from volunteers with healthy teeth and gums. He isolated these bacteria and put them together in a probiotic mix called ProBiora3, which can be found in EvoraPlus. This type of bacterial mix works to crowd out the pathogenic bacteria and has been reported to whiten teeth, reduce gum bleeding, inflammation, and biofilms of pathogenic bacteria. The probiotics are available as orally dissolvable mints that are to be taken twice per day for 30-90 days. You can also try a probiotic toothpaste. Designs for Health makes PerioBiotic toothpaste, a special probiotic toothpaste that is free of fluoride and triclosan and packed with probiotics. The key to getting the most benefit from this toothpaste is to forgo rinsing your mouth after brushing your teeth, allowing the beneficial bacteria to stay in your mouth longer. It feels strange and first, but eventually, you will get used to it. I recommend trying and continuing with some of the self-care steps I’ve introduced here. If you find you want a more comprehensive routine, visit page 326 of Hashimoto’s Protocol for the Root Cause Basic Dental Protocol. Dental triggers of Hashimoto’s are frequently overlooked, but you now know that dental history must be considered when thinking about potential igniters of autoimmunity. Have any of the triggers outlined here sparked an aha moment for you? Have you addressed a dental trigger and noticed that it helped resolve any Hashimoto’s symptoms or just made you feel better in general? I hope this information will help you on your journey! 1) The Cranberry Institute – Dedicated to supporting research and increasing awareness about the health benefits of the cranberry. Cranberryinstituteorg. 2017. Available at: http://www.cranberryinstitute.org/. Accessed June 22, 2017. 2) Patil B, Gururaj T, Patil S. Probable autoimmune causal relationship between periodontitis and Hashimotos thyroidits: A systemic review. Nigerian Journal of Clinical Practice. 2011;14(3):253. doi:10.4103/1119-3077.86763. 3) Fluoride Linked To Gum Disease. Medical News Today. 2017. Available at: http://www.medicalnewstoday.com/releases/71584.php. Accessed June 22, 2017. 4) Vandana K, Sesha Reddy M. Assessment of periodontal status in dental fluorosis subjects using community periodontal index of treatment needs. Indian Journal of Dental Research. 2007;18(2):67. doi:10.4103/0970-9290.32423. 5) Dittmann R. Brighton Baby: A Revolutionary Organic Approach To Having An Extraordinary Child. Bloomington, IN: Balboa Press; 2012. 6) Diabetes Self-Management – Diabetes Articles and Recipes. Diabetes Self-Management. 2017. Available at: https://www.diabetesselfmanagement.com. Accessed June 22, 2017. 7) Foundation A, Price A, Directors B et al. Home – The Weston A. Price Foundation. The Weston A Price Foundation. 2017. Available at: http://Westonaprice.org. Accessed June 22, 2017. 8) Bonner M. To Kiss Or Not To Kiss. A Cure For Gum Disease. Editions AMYRIS; 2013. 9) Bonner M, Amard V, Bar-Pinatel C et al. Detection of the amoeba Entamoeba gingivalisin periodontal pockets. Parasite. 2014;21:30. doi:10.1051/parasite/2014029. 10) Mercury allergy – MELISA. Melisaorg. 2017. Available at: http://www.melisa.org/mercury/. Accessed June 22, 2017. 11) Sterzl I, Prochazkova J, Hrda P et al. Removal of dental amalgam decreases anti-TPO and anti-Tg autoantibodies in patients with autoimmune thyroiditis. . 2006. Available at: https://www.ncbi.nlm.nih.gov/pubmed/16804512. 12) Welcome to Clifford Consulting & Research Online – North American English version. Ccrlabcom. 2017. Available at: http://www.ccrlab.com. Accessed June 22, 2017. 13) Fluoride Linked To Gum Disease. Medical News Today. 2017. Available at: http://www.medicalnewstoday.com/releases/71584.php. Accessed June 22, 2017. 14) Easy Ways To Remove Fluoride from Tap Water. ThoughtCo. 2017. Available at: http://chemistry.about.com/od/chemistryhowtoguide/a/removefluoride.htm. Accessed June 22, 2017. 15) Choi A, Sun G, Zhang Y, Grandjean P. Developmental Fluoride Neurotoxicity: A Systematic Review and Meta-Analysis. Environmental Health Perspectives. 2012;120(10):1362-1368. doi:10.1289/ehp.1104912. 16) Fa-Fu L et al.The Relationship of a Low-Iodine and High-Fluoride Environment to Subclinical Cretinism in Xinjiang. Slweborg. 2017. Available at: http://www.slweb.org/IDD.html. Accessed June 22, 2017. 17) Fluoride Action Network | Mikhailets (1996): Functional state of thyroid under extended exposure to fluorides. Fluoridealertorg. 2017. Available at: https://fluoridealert.org/studies/mikhailets-1996/. Accessed June 22, 2017. 18) Water C, Council N. Fluoride In Drinking Water. Washington: National Academies Press; 2006. 19) Susheela A, Bhatnagar M. Excess Fluoride Ingestion and Thyroid Hormone Derangements in Children Living in Delhi, India. The International Society for Fluoride Research. 2005. Available at: http://www.fluorideresearch.org/382/files/38298-108.pdf. Accessed June 22, 2017. 20) Fluoride Action Network | Thyroid. Fluoridealertorg. 2017. Available at: http://www.fluoridealert.org/issues/health/thyroid/. Accessed June 22, 2017. 21) Basha P, Rai P, Begum S. Fluoride Toxicity and Status of Serum Thyroid Hormones, Brain Histopathology, and Learning Memory in Rats: A Multigenerational Assessment. Biological Trace Element Research. 2011;144(1-3):1083-1094. doi:10.1007/s12011-011-9137-3. 22) Zeng Q, Qui Y et al. Studies of fluoride on the thyroid cell apoptosis and mechanism. Neuro Endocrinol Lett.2012. Available at: https://www.ncbi.nlm.nih.gov/pubmed/22800594. 2012. 23) The Controversial Link Between Fluoride and Thyroid Disease. Verywell. 2017. Available at: http://thyroid.about.com/od/drsrichkarileeshames/a/fluoride2006.htm. Accessed June 22, 2017. 24) Nabrzyski M, Gajewska R. Aluminium and fluoride in hospital daily diets and in teas. Zeitschrift für Lebensmittel-Untersuchung und -Forschung. 1995;201(4):307-310. doi:10.1007/bf01192722. 25) Fluoride Action Network | F.A.Q. Fluoridealertorg. 2017. Available at: http://www.fluoridealert.org/faq/. Accessed June 22, 2017. 26) Fluoride Action Network | Considerations When Buying a Water Filter. Fluoridealertorg. 2017. Available at: http://www.fluoridealert.org/content/water_filters/. Accessed June 22, 2017. 27) Fluoride Action Network | Fluoride Content of Bottled Water. Fluoridealertorg. 2017. Available at: http://fluoridealert.org/content/bottled-water/. Accessed June 22, 2017. 28) Fluoride Action Network | Broadening Public Awareness on Fluoride. Fluoridealertorg. 2017. Available at: http://fluoridealert.org/. Accessed June 22, 2017. 29) Adedara I, Ojuade T, Olabiyi B et al. Taurine Ameliorates Renal Oxidative Damage and Thyroid Dysfunction in Rats Chronically Exposed to Fluoride. Biological Trace Element Research. 2016;175(2):388-395. doi:10.1007/s12011-016-0784-2. 30) Yang H, Xing R, Liu S, Yu H, Li P. γ-Aminobutyric acid ameliorates fluoride-induced hypothyroidism in male Kunming mice. Life Sciences. 2016;146:1-7. doi:10.1016/j.lfs.2015.12.041. Hi, thank you for your interesting article and for your good and important work! I have one question: I have tried several fluoride-free toothpastes, but my problem is that then I get extremely sensitive teeth. It seems fluoride is the only thing I have found that really helps against the “icing” pain of sensitive teeth when I have hot, cold, sweet or acidic foods and drinks, or even when breathing in cold air. It is so annoying that even though I know fluoride is not good for the health, I use fluoride toothpaste most of the time (but I live in a country where there is not added fluoride to the drinking water). Do you have some advice when it comes to this sensitive teeth problem? Is there something else I could use to get less sensitive teeth? I am already very good at brushing and flossing every day, and I don’t drink a lot of very acidic drinks (but I do like a cup or two of coffee and black – but not very strong – tea, and I’m not very likely to quit this habit). Ingrid – thank you for following this page, and for your support. You may wish to seek out a Biological Dentist. Ingrid – thank you for following this page. One of the keys to dental health is balancing the PH in your mouth. You could try making an alkaline mouthwash by taking 8 ounces of filtered water with 1 teaspoon of baking soda, 20 drops of peppermint oil, and 5 teaspoons of Xylitol. Rinse with that twice a day and after meals. The Xylitol breaks up the bacterial biofilms allowing for better elimination. You can also use a periobiotic toothpaste and oral probiotics to balance the bacteria in your mouth, much like you would use probiotics to balance the bacteria in your gut. Thank you for the good advice! I will certainly try them out! I have recently bought your two books, the “Hashimoto … the Root Cause” and “Hashimoto’s Protocol” and look very much forward to reading them during the summer! Again: thank you so much for all you do for this cause! My main problems are subclinical hypothyroidism “probably caused by autoimmune inflammation of the thyroid gland” (my doctor says) and electromagnetic hypersensitivity (EHS), which is not an official diagnosis, but unfortunately a very real problem for me, and for an increasing amount of people. In my case the symptoms I get when I am too much exposed to pulsed microwave (MW) radiation from common wireless technology are very much the same as Hashimoto’s symptoms (I get flu like feeling which sometimes can last for several days after the exposure, brain fog, cognitive decline, memory and concentration problems, irritability or even depression, fatigue, sleep disturbance, mood swings) together with headache or strong feeling of “pressure” in head and chest as well as (sometimes) skin irritation/rash. Except for the flu like feeling and some of the cognitive issues most symptoms are usually strongly reduced (or go away totally) a short time after the exposure is reduced. In my case the two conditions seem somehow interrelated, at least that’s my guess. I see MW-radiation and EMF’s as a probable main root cause and a strong trigger of my thyroid problems (another strong trigger for some symptoms – and stomach problems – is gluten), especially as I found out I grew up in a flat very close to a very early base station/ phone masts (Nordic counties started early with mobile phone systems), and some of my health issues started very early in life. (I have also read abstracts of a couple of studies that suggest that “weak” pulsed MW radiation could have some influence on the thyroid function). I know this has nothing to do with the teeth topic of your article (Sorry! ), but I just wanted to bring your attention to the EHS issue in case you start to see more patients with that sort of problems. Ingrid – Thank you for your support. Please, understand that due to liability issues, I am unable to answer specific medical questions, but I highly recommend that you work with a functional medicine clinician. It’s an entire medical specialty dedicated to finding and treating underlying causes and prevention of serious chronic disease rather than disease symptoms. I wish I had been able to access all the knowledge and information in your article, but I am 75 now and most of the damage happened when I was young, smoked, and no one had any idea what was happening to my teeth and gums. 15 years ago I finally found a dentist in Edinborough to remove my amalgam fillings, which had been put into my teeth by a London dentist I went to in my first year in London, when I was 22 years old…and my teeth were healthy, the dentist actually drilled holes in my teeth and filled them, only so he could get paid regular fees. It has been downhill ever since then. Wish I could start over again…have to wait til next lifetime. Alice – thank you for following this page. My heart goes out to you. One of the keys to dental health is balancing the PH in your mouth. You could try making an alkaline mouthwash by taking 8 ounces of filtered water with 1 teaspoon of baking soda, 20 drops of peppermint oil, and 5 teaspoons of Xylitol. Rinse with that twice a day and after meals. The Xylitol breaks up the bacterial biofilms allowing for better elimination. You can also use a periobiotic toothpaste and oral probiotics to balance the bacteria in your mouth, much like you would use probiotics to balance the bacteria in your gut. I highly recommend a Biological dentist. Biological dentistry is a branch of dentistry that looks at the connection between oral care and the health status of the rest of the body. While most traditional dentists focus only on “rescue care” rather than prevention, biological dentists try to prevent health problems that may originate from exposure to certain procedures and materials. To find a biological dentist in your area, visit the International Academy of Oral Medicine & Toxicology’s website at http://www.iaomt.org for a listing. This helps me so much. I now have a fistula due to a cracked tooth. There is no telling how long my body has been dealing with bactetia from this cracked tooth. I am scheduled for extraction this Wednesday. I am wondering if this was my trigger. Gloria – thank you for following this page. I hope your procedure goes well. Gloria – thank you for following this page. Here are some articles you may find interesting. Debbie – thank you for following this page. I am so sorry to hear this. I highly recommend a Biological dentist. Biological dentistry is a branch of dentistry that looks at the connection between oral care and the health status of the rest of the body. While most traditional dentists focus only on “rescue care” rather than prevention, biological dentists try to prevent health problems that may originate from exposure to certain procedures and materials. To find a biological dentist in your area, visit the International Academy of Oral Medicine & Toxicology’s website at http://www.iaomt.org for a listing. Any information on orthodontics? Or is this a whole different subject? Ann – thank you for following this page. Here are other articles that may also be of interest to you. Ann – thank you for following this page. I highly recommend a Biological dentist. Biological dentistry is a branch of dentistry that looks at the connection between oral care and the health status of the rest of the body. While most traditional dentists focus only on “rescue care” rather than prevention, biological dentists try to prevent health problems that may originate from exposure to certain procedures and materials. To find a biological dentist in your area, visit the International Academy of Oral Medicine & Toxicology’s website at http://www.iaomt.org for a listing. I have thyroid nodules diagnosed 2 years ago. I’ve consulted a biological dentist regarding my on/off mouth/tongue ulcers for more than 10 years now and she suggested to perform a dental CT scan for my teeth because noticed a discolored teeth in one of my tooth where there’s dental filling. Is dental CT scan safe? Mona – thank you for following this page. Please, understand that due to liability issues, I am unable to answer specific medical or dental questions. Mona – thank you for following this page. Nodules and goiters are often the result of toxicity and/or the autoimmune process. So, doing interventions to reduce the autoimmune attack on the thyroid, and toxicity, can be helpful to reduce them. Have you read my books? Have you found any research on dental implants? I have had a tooth pulled because of infection below an old root canal and need to have another one pulled for the same reason. I would rather have an implant than a bridge, but I am wondering if the material in implants would cause any problems? Janella – thank you for following this page. I highly recommend a Biological dentist. Biological dentistry is a branch of dentistry that looks at the connection between oral care and the health status of the rest of the body. While most traditional dentists focus only on “rescue care” rather than prevention, biological dentists try to prevent health problems that may originate from exposure to certain procedures and materials. To find a biological dentist in your area, visit the International Academy of Oral Medicine & Toxicology’s website at http://www.iaomt.org for a listing. I had a bump appear on my gum, near the tip of the root. Nothing showed up on X-Ray, and my biological dentist sent me to a periodontist that had a cone beam X-Ray, which is a 3D scan of the entire jaw. She pointed out the tooth that was bothering me, and also asked to have the root canaled teeth looked at. Two of my root canaled teeth have infections, and the recommendation was to have then extracted. These infections did not show up on X-Ray and I had no symptoms (pain, hot, cold). I just always seemed to have a stuffy nose, and that went away almost immediately when the teeth were extracted. Larry – thank you for following this page and for sharing. Esther – Most thyroid conditions result from the immune system attacking the thyroid because the immune system is out of balance. Even when the thyroid is taken out surgically, is ‘dead’, or treated with radioactive iodine the autoimmunity still persists in most cases. Many people will have their thyroids removed, and will develop new autoimmune disorders such as Lupus, Rheumatoid arthritis, etc. The immune system just finds a different target. We need to re-balance the immune system to prevent this (sometimes the autoimmunity can be reversed as well). The gut determines your immune system. With the exception of discussing proper thyroid medication dosing, the majority of my website and my book focuses on balancing the immune system. The info I present is based on my own research and journey for overcoming my autoimmune thyroid condition. Hi Dr. Izabella! Thanks for the informative article! What are your thoughts on mouth rinses with hydrogen peroxide? My dental hygienist suggested an organic one called Essential Oxygen, as she knows I won’t try the conventional ones. I just didn’t know if the hydrogen peroxide would affect my TPO antibody levels or if there is even a connection with thyroid peroxidase and hydrogen peroxide?? Can you shed any light on this for me? Thanks! Tasha – thank you for following this page. I highly recommend a Biological dentist. Biological dentistry is a branch of dentistry that looks at the connection between oral care and the health status of the rest of the body. While most traditional dentists focus only on “rescue care” rather than prevention, biological dentists try to prevent health problems that may originate from exposure to certain procedures and materials. To find a biological dentist in your area, visit the International Academy of Oral Medicine & Toxicology’s website at http://www.iaomt.org for a listing. Forgot to ask something else! I noticed your Rootcology Liver and Gallbladder Support contains milk thistle. Have you heard of anyone’s ferritin levels reducing after using milk thistle? Thanks! Dear Izabella. Thank you for your great work and your great book. I have recovered greatly in the last five years. I have never had big issues with my teeth. I have demineralization problems with my number 6 teeth allover. These were fixed with preventative amalgamfillings when I was a teenager. I had them removed for plastic 14 years ago which was great. Now I have broken a piece on one if these and the dentist recommends a metal inlay. I think he is right in thinking plastic doent do the trick. However I am very reluctant in bringing metal back into my mouth. Where I live I cant find any dentists that can test for biological compatible material. In that case what would you vonsider the safest option? Tina – thank you for following this page. thank you for following this page. Please, understand that due to liability issues, I am unable to answer specific medical questions, but I highly recommend a Biological dentist. Biological dentistry is a branch of dentistry that looks at the connection between oral care and the health status of the rest of the body. While most traditional dentists focus only on “rescue care” rather than prevention, biological dentists try to prevent health problems that may originate from exposure to certain procedures and materials. To find a biological dentist in your area, visit the International Academy of Oral Medicine & Toxicology’s website at http://www.iaomt.org for a listing. Lindsey – Thank you so much for asking about me. We are each so unique. I really encourage each person to follow their own customized path to health. Here are some articles that you may find helpful. 7 yrs (5 by age 13) Gus, the cast man and I were on a first name basis. Everyone just labeled me clumsy….. In one of my ureters. (A trigger?) I had 5 benign Nodules removed with half my thyroid gland at age 15. I finally began menstruation the following year. problem solved…. Right?? wrong. I had a fairly mild bout of Epstein Barr at 16. (A trigger?) By age 17, Depression set in and problems at home. I had my thyroid checked yearly with paps and was always told it’s fine. I had all the regular symptoms of hypothyroid, but they Kept telling me my unusual symptoms Were not thyroid related. Thanks to your research and digging I believe it was adrenal related. I finally Was told I MAY have a thyroid problem and was placed on Synthroid. I was about age age 37. Within a few hours (not exaggerating) I thought the gates of heaven had opened. The change was dramatic in every way! (I thought so this is what it’s like to feel normal). it was short lived. Dr was afraid to overmedicate me. We went up and down and Up and down. I finally saw an integrative medicine doctor at about age 49, and he put me on Westthroid…. again a dramatic change. Until you have to do it. No regrets. The Anxiety was horrible, and I started taking clonidine about 3 yrs into it. Way they did it before you were born!!! Article on Dental triggers: I have been a Dental Hygienist for a long time in many different types of practice settings. I have always enjoyed the practices that take the patient as a whole, and consider the larger picture! I used to have really sensitive teeth and had to get numb to have them cleaned. and all my sensitivity went away!!! Many chemicals in the toothpaste.!!! And now have hot lemon tea with lemon juice also added. As I was sipping on it one day, it occurred to me that I can’t drink a whole pot all day like I did with the coffee Due to the acid content. I caution my patients constantly on high acidic and carbonated beverages (carbonation from phosphoric acid) can lead to increase decay. When the pH in the mouth is lowered, minerals from the enamel leach out into the saliva. The saliva will neutralize the acid but it takes time. 20 mins 30-40 mins as we get older, also dry mouth from meds. Attracted back to the enamel. It’s a constant processs. But with sipping and nibbling all day, the teeth can’t recover the minerals. All carbs produce acids. Not all day. If you want to have some juice or water with lemon. Drink It! Is not as important as the Frequency!!! you may have a Thyroid problem till I was 37 . Karan – thank you for following this page and for sharing! 🙂 Here are some articles you may find interesting. Hi, Dr. Wentz! What do you think about “miswak”? It is an ayurvedic toothbrush that contains natural fluoride… I dont know if it is safe to use it with thyroid problems. Andrea – that’s a great question! I cannot say as I have not done the research. I’ll add this to my list of future article possibilities. I would love to hear more about your experiences here on this page! 1. What if we have infection and doctor says that root canal is best Option but as you mentiond that after root canal may be the bacterias are still there or infection so what if we will remove the tooth and on that place only gum will be there or you recommend something different ? Momna – thank you for reaching out. I highly recommend you discuss this with a Biological dentist. Biological dentistry is a branch of dentistry that looks at the connection between oral care and the health status of the rest of the body. While most traditional dentists focus only on “rescue care” rather than prevention, biological dentists try to prevent health problems that may originate from exposure to certain procedures and materials. I have just finished Module 9 of your Self Management Program, very informative! I am 61 years old and unfortunately for what ever reason, I had terrible dental health as a child resulting in 13 amalgam fillings. Thank goodness my wisdom teeth were extracted. Although my front teeth look great, I have a mouth full of mercury that has been there for at least 40 years. I did discover that I have Hashimoto’s just a year ago, but had all the symptoms as long as I remember. My new found friend, the endocrinologist is sending me for about 50 blood tests, one of which is the MTHFR gene variation. My question is that if I do not have the variation that prevents proper excretion on heavy metals and keep the fillings in place, would it be prudent to stay on Liver Protocols long term? Would taking NAC and continuing the cilantro as a daily thing be a problem? I am not seeing all these fillings coming out. As an aside, my sister, who does not have Hashimoto’s (at least she hasn’t been tested) has developed an allergy to her fillings at age 62. After the expected eye roll from her dentist, he finally accepted the possibility that her dermatologist is right. Jane – thank you for reaching out. I am so sorry you are struggling with all of this. <3 For questions about the protocols on the Self Management program please email my team at info@thyroidpharmacist.com and they will be happy to help you.